The Romanian leu traded with a mild appreciation bias yesterday though it still failed to break below 4.6600 and closed the day around 4.6610. We look for a similar scenario today, trading just above 4.6600 with an eventual test below it if risk sentiment improves. 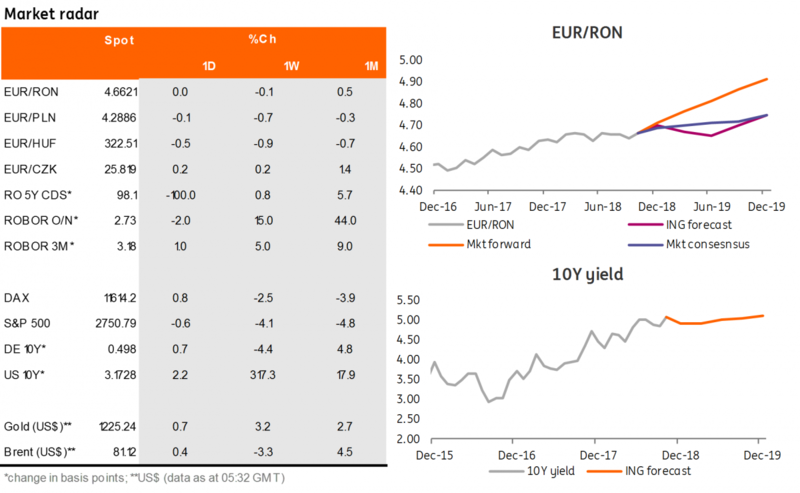 Despite a very successful primary market auction, ROMGBs had a weak session yesterday, with yields closing some 6-7 basis points higher at the front end while the back end were a bit more resilient though yields still inched up some 3 basis points. However, the February 2029 auction saved the day as the MinFin managed to upsize the allocation to RON648 million from the 500 million initial target while printing an average/maximum yield of 5.15/5.18%. This was quite a bit below our expectations which were in the 5.20-5.25% area. Bid-to-cover was also strong at 1.86x acting as a self-fulfilling prophecy. The quick increase in liquidity for the new 10Y benchmark could lead to index inclusion earlier than expected. This is likely behind the current buying interest on hopes that new buyers would join after the inclusion in the benchmark index. The cash rates continued to trade around 2.85%, unaffected by the central bank's (NBR) decision not to organise a repo auction. Uncertainty over the NBR’s stance is nevertheless reflected in the longer tenors as the 1M is again trading close to the credit facility rate of 3.50% while the 1Y inched some 10 basis points higher to 3.90%.